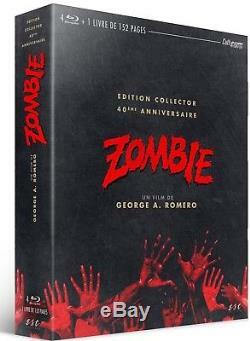 I propose the ultimate blu-ray box of zombie, the famous film george a. Romero will be released in March 2019. An edition worthy of the name, only findable in France and will include. The 3 major versions of the film will be gathered for the first time on the territory in the same box, namely. The European cinema version released in 1978 cult and indispensable. The director's cut us version of 1979, enriching the experience of the film. And for the first time in France, the long exclusive version, long awaited by the fans and never exploited in France, presented at the festival of cannes 1978! Here are the details of the contents. The zombie film European version, 119 minutes, new high definition master, French version and French subtitled original version, 1978. Audio comments of the 5 main actors. Audio commentary from producer richard rubinstein. Audio commentary by composer claudio simonetti. Unpublished presentation by Julien Severéon, around the zombie world. Unpublished presentation by bertrand bonnello in front of the audience of the cinematheque. The zombie movie version director's cut us, 127 minutes, new master high definition, original version with French subtitles, 1979. Interview with dario argento, claudio argento, alfredo cuomo, claudio simonetti. The special effects of zombie, by benoît lestang (17'45 - vf). "about romero" by jean-pierre putters (18 '). The long version zombie movie presented at the festival of cannes 1978, 139 minutes, new high definition master, French version and original version with French subtitles, 1978. Romero "romero zombies" by linda tahir and christophe champclaux (26). Analysis of the zombie montage, by eric dinkian: why two versions of the film (1643 vf). The dead will walk, (75 '), 2004. Documentary: "document of the dead" (8357). And more 2h bonus surprises spread over 4 blu-ray. 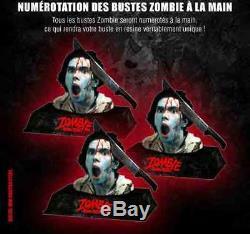 1 book 152 pages: book written by marc toullec on the 6 films of the undead george a. You will of course have the beautiful zombie resin bust, numbered by hand (apparently there will be 200 copies, to reconfirm). Also, a 4th version of the full frame film in 1.33 of the European version. On top of that, I offer you as a gift. 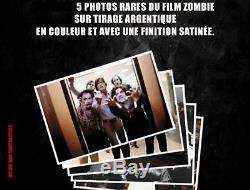 5 rare photos of the zombie film on silver print in color and with a satin finish. 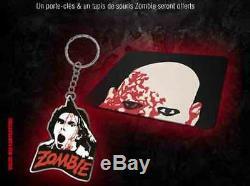 1 keychain + zombie mouse pad. New digitization of the European version from 35mm coils, so new restoration. Blu-ray 4k ultra HD from the European version from the 4k master. Notice to collectors and / or fans of the film! Attention, I remind you that this box is in pre-order, you will receive it in March 2019 (provided that the supplier keeps its deadline). The photos are not contractual and the details of the contents can be modified without notice. The item "Box Ultimate Blu-Ray rare zombie with bust ultra limited (preco March 2019)" is on sale since Friday, December 28, 2018. It is in the category "dvd, cinema \ dvd, blu-ray". The seller is "kurtc1996" and is located in / in nord-pas-de-calais. This item can be shipped to the following country: France.